Have you ever received an unexpected surprise? Something that comes out of nowhere, like out of the blue? Or getting something that you know you didn’t deserve? It happened to me, just recently. Last November, I was notified by the Korean Consulate General’s office. Apparently, my grandfather was a patriot during the 1920’s. He was part of the Provisional Government of Korea during the Japanese occupation. He and his father-in-law (my great-grandfather, who was the President of this Provisional Government) helped keep the infra-structure of Korea together during this tumultuous period. 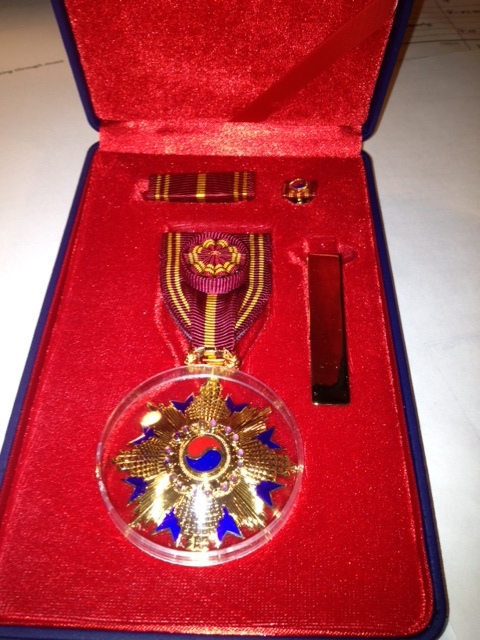 Now, nearly 50 years after his passing, the South Korean government wanted to give my grandfather a medal of honor posthumously. Since I am the oldest surviving male descendent in my grandfather’s family, I received the medal – under much pomp and circumstance. I did absolutely nothing to merit this; just happened to be related to the right guy and born to the right son and happened to be the oldest son, at that. I kind of felt like “Forrest Gump”; I was at the right place at the right time. But this story goes on. I received another phone call from the Korean Consulate a couple of weeks ago: they wanted to invite me as their guest to a dinner with the President of South Korea! (I mentioned this in passing in the Wednesday blog this week) This is a rather historic occasion as President Park of South Korea is the first woman President in the history of the country. Again, I did nothing to receive this invitation; I was just the guy who received the most recent Medal of Honor on behalf of someone else who was important! I had mixed feelings about this at first: while it was a great honor to attend this dinner, I could not bring anyone else, and I do not speak the language (much to my shame, I am a total “gringo”!) I would be alone at this dinner, not knowing anyone and not being able to understand what is going on. My initial reaction was to decline the invitation: I would just be too uncomfortable and it promised to be a long, awkward, miserable night for someone who really shouldn’t be there. But then I was reminded of verse in James 1: “Every good and perfect gift is from above, coming down from the Father of Lights” (verse 17). This invitation was not from the Korean Consulate or from the President of South Korea. It was from my Heavenly Father. It was not for me to judge whether this would be comfortable (many of God’s invitations are not to comfort, but to opportunity) or miserable. Like Samuel hearing the night time Voice, or cowering Gideon receiving the hero’s greeting from the angel, or ruddy David being chosen over his stronger brothers, I received an underserved and unexpected surprise to walk into something wonderfully unknown! So I’m going! It’s next Wednesday (May 8th at the LA Live Marriott). Please pray for me! I have no idea why God wants me there or if anything significant will take place. And I will let you know what happens! Oh one more thing to the story of my grandfather. The Japanese exiled him from Korea for his involvement with the Provisional Government. He and his wife settled down in Central California where they raised my dad and uncle. And he pastored a Presbyterian Church in Dinuba, CA. In his later years, he would take his oldest grandson on many walks (wagon rides, when I was really little) and try to talk about God in his broken English to me. The one thing I remember him teaching me clearly was that “God” is my “Heavenly Father.” It was something that stuck with me for nearly five decades. When he passed away (I was 8 years old), it was the first time that I experienced true sadness in my life. I loved my “Papa” so much! So maybe it’s no big surprise that my Heavenly Father of Lights would give me such an amazing, profound, good and perfect gift to remember the man who introduced me to Him. I love the essence of this post that God adeptly surprises us with both opportunity and comfort. I’m reminded of the comfort-surprises, the good gifts from above for God’s people.There’s quite a trail of stories in the Bible. Jacob thought he’d lost Joseph, Simeon, and would possibly lose Benjamin. He didn’t. Wouldn’t I have loved to be a fly on the wall when those wagons from Egypt rattled back into the family compound. Simeon and Benjamin were safe, and Jacob (Israel) wast told that his beloved Joseph was still alive and second-in-command in Egypt. And the list goes on and on. Moses probably thought he’d die with the smell of sheep on his hands. No. He died on a mountaintop with God as his caretaker. Barren Elizabeth and Zachariah held prophet-baby John in their wrinkled old arms. We can be conditioned to expect the worse, but I want to move to a different camp and wait and expect good surprises from God. And when his gifts arrive, yes, I’m sure I’ll still be surprised!. . Thanks, Cathy! Great illustrations, stories and insights to the God who loves to surprise us with his love, grace and truth. Your comments inspire me to worship him more! Beautiful! I can’t wait to hear about this dinner and whatever may come of it. Great blog. I’m in Randy ‘s small group,and this story about being raised in Dinuba was shared not too long ago. I’ve enjoyed reading you’re inspirational blogs. Thanks, Laura! I’m excited that Randy is sharing this blog with your small group in Bakersfield. Give my blessings to the brothers and sisters at The Bridge – one of my favorite fellowships to worship God! Fantastic! Praise the Lord! I can hardly type because of the tears! Oh Doug, What a blessing. My tears also fuzzied my vision to finish this read, but what a wonderful testimony of the faithfulness and love of your grandfather and Heavenly Father, together. Thanks for sharing. Hey Doug, I’m really enjoying your blog posts. Thanks and keep up the good work! We’ll keep you in our prayers for your dinner tomorrow.